Welcome to Filey Methodist Church. The small town of Filey is on the East Coast between Scarborough and Bridlington. 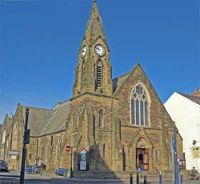 Our church is in the centre of the town so we are well placed to offer fellowship and to share our faith with Filey folk and visitors. We have Open Church through the holiday season, regular coffee mornings, a music festival, seasonal activities, Messy Church, Bible study and the men’s recreational fellowship to name a few events. Our welcome is warm and our prayer is that all who come on to our premises, for whatever reason, will sense something of God's presence. We also pray that the local groups and schools, who use our premises, feel that they too are an important part of our family. Filey Methodist Church sharing joyfully in the life and work of the universal Church. * offering friendship, meaning and hope to all.